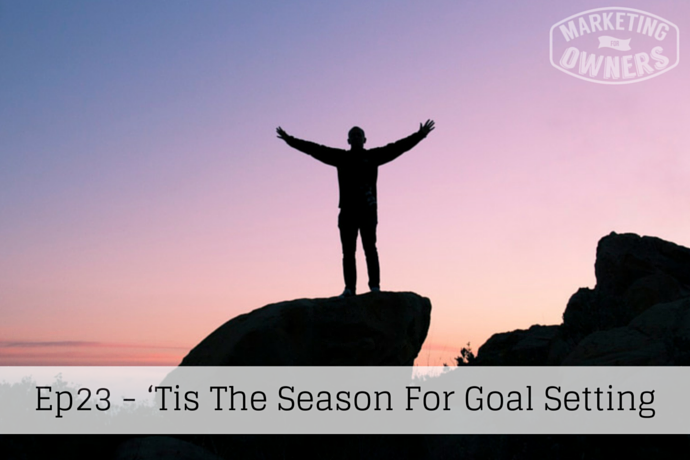 ‘Tis the season for goal setting. Yes, it’s that time of year, Christmas is finished, the tree’s going to come down, all the presents have got to back to the stores if you’ve got the receipts, or all the toys have broken, and you’re looking forward to New Year’s Eve and you’re dreading New Year’s Day because you have to set goals for 2015. Your email inbox, your Facebook pages and your Tweeter streams are full of recommendations from very clever people who are telling you to set goals to make 2015 your most successful year ever, and telling you how you can do it. Pinterest is giving you new infographics of how to set them. And they are right. This is a good time to set them. Personally, I don’t see why we have to do it in January, and I set goals throughout the year, but January is accountable, it’s easy to remember when to do it, it’s easy to look back as to when it started, and to have some accountability there. But there are a few tricks to setting goals, if you want to actually get them done, because of cause a lot of people want to lose all the weight, they want to make a fortune and it all starts in January, but these are too easy. So, the first trick is to write them down, every single successful person you’ll ever read about will have goals, and one of the common characteristics is they will all have them written down. It’s no good lying in bed thinking about what you’re going to do when you win the lottery. Whether you’re going to buy Ferrari or a Porsche, where you can spend your next holiday, what size of yacht you’re going to buy, etcetera. That just isn’t going to work, so write them down. By writing, you commit, you have to think, and there is a relationship between the brain and hand, and the movement that makes it sink in better, or, again, commit. If you’re not going to commit to your goals, you might as well not bother. Another trick is not having too many. Some people will think, “Oh, twelve months in a year is a long time”, and set loads of them thinking there’s lot of time. Too many just makes it overwhelming. One of the most successful CEO’s in history is Jack Welch of GE (General Electric). He built the company into one of the largest in the world during his twenty-year tenure. He only ever set goals over a short-term period of ninety days and a long-term period of ten or fifteen years. In those twenty years, he only ever had something like three or four long-term serious goals, and he probably achieved them all, a very, very, dedicated guy. There’s a great acronym called “SMART”, which gives you Specific, Measurable, Achievable, Relevant, and Time specific goals. And think about that. Specific is one of the most important. Everybody after Christmas, including me, ate too much food and is thinking, “I want to lose weight”, but ‘losing weight’ is not a goal. Losing ten pounds, losing ten pound in three months, that’s a specific goal, that can then be measured, and that can be achieved, and it’s relevant, and it’s time specific. So be careful when you’re setting goals. But, more importantly, do set some. 2015 can be the year everything really starts to turn around, and everything really gets on track. It can be your most successful year, so why not give it a go? And remember, when you write them down, write them somewhere where you can look at them again, try Evernote, that’s where I write mine. It’s Wednesday and we like to recommend somebody to follow on Wednesday. It’s a friendly follow and it’s for a company called Social Media Examiner (@smexaminer) from Mike Stelzner (@Mike_Stelzner), (Michael Stelzner). 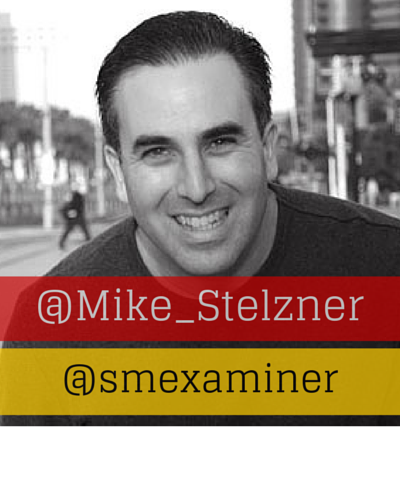 Social Media Examiner covers all the aspects of social media, and what Mike does, is to employ the best writers and the top minds, or top thought leaders, people from Neil Patel, Mari Smith, Kim Garst, and anyone else you can think of to produce fabulous articles and great graphics. But the way they hand their social media is excellent, he will say shows, how to compare having a company page for which is SM examiner, amongst/along with his personal page, where we’ll show his real side, as long as for makes him his work, as so fantastic design, example of premium model, because they give fabulous information that makes people prepare to pay for. He will then makes all his money from selling conferences and he does it couple a year, and makes rather along, so go look at what he’s up to, learn and emulate. He does very, very, very, very, well. Something else to look out is New Rainmaker who sponsor these podcasts. Rainmaker is a platform that creates your website, hosts it – does everything you need. It is excellent and MarketingForOwners.com runs on Rainmaker. That’s it for today and I look forward to seeing you tomorrow when I’ll give more details on how I set my goals.